1 February 2019 – join us! For more info or to book your place please email Sally Nash. The Grove Youth Series was established by Midlands CYM and is run in partnership with staff from other CYM centres, youth workers and organizations. From our first book on Responding to Challenging Behaviour we have sought to publish booklets that are accessible, relevant and help people to become more effective youth workers. The booklets are all written by practitioners and includes lots of first time authors. If you are interested in writing a booklet then please complete a proposal form and email it to s.nash@stjohns-nottm.ac.uk. We also have a Grove Youth Series Facebook page – feel free to make suggestions about potential book topics there too. 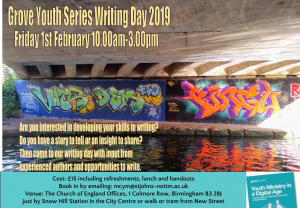 A small editorial team work on the Grove Youth Series, if you have editing skills and might be interested in joining us, we meet three times a year in Birmingham then get in touch with Sally Nash, MCYM Director who does the admin for the group. We are also looking for people who may review the book for a popular blog or newsletter.